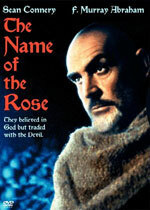 adapted as "The Name of the Rose"
Synopsis: In seven days of apocalyptic terror, a killer strikes seven times--and seven monks die. The year is 1327. The place is a wealthy abbey in Italy. And the crimes committed there are beyond the wildest imaginings. It will be the task of English Brother William of Baskerville to decipher secret symbols and dig into the eerie labyrinth of abbey life to solve the mystery. 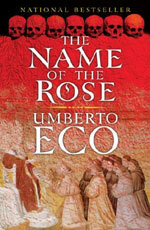 Additional notes: The book cover image is of the English language translation paperback.